Living and growing up in New England, I have had the pleasure of eating lobster, clams, mussels, shrimp, and the like. But I was never formally introduced to oysters. Noticing them recently where I food shop, I started to wonder if I could shuck oysters at home. Not only did this store sell oysters, they were also selling shucking knives. I discussed, with my wife, my interest in trying to shuck oysters. In return, she bought me my first book about oysters and a knife. Rudely, I asked, "Where is the shucking glove?" She explained to me that her research showed that a good shucking glove is expensive. She went on to say that she thought I would shuck oysters once or twice and never again. She was wrong, on both accounts. For under $10, I found a pair of gloves that work well for me and I now shuck oysters at any excuse - for my wife, friends, family, holidays, even at parties. Anytime, anywhere! 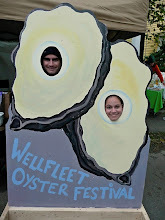 I hope this blog helps you to "Go Shuck An Oyster" and to enjoy oysters. I will share books, products, events, reviews, and other interesting oyster information worth sharing. Enjoy and get ready to Go Shuck An Oyster.